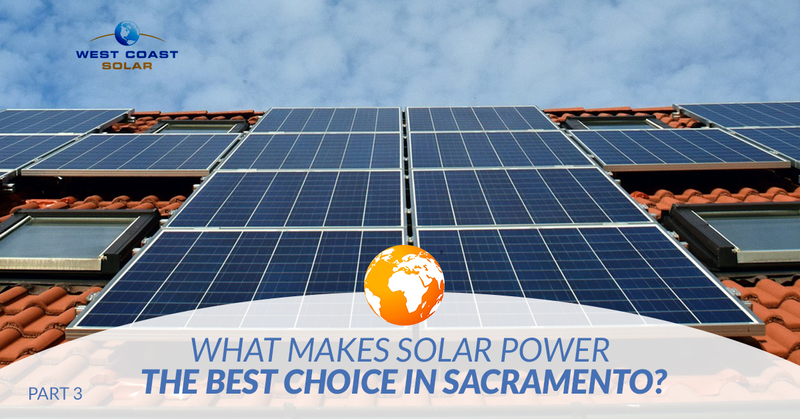 What Makes Solar Power The Best Choice in Sacramento? When you’re looking for a way to reduce your ever-rising utility bill, it can seem daunting with so little solutions at your disposal. You may also notice the consistent rising of carbon-emissions in our global atmosphere. What can one person do to save money on energy bills and help heal the environment for the future of their family? West Coast Solar believes renewable energy is the solution to both of these situations. A home solar energy system will provide reduced, if not entirely eliminated, utility bills, and it will substantially reduce the pollution of the homeowner’s residence. Whether you’re looking to cut costs, save the planet, or both, West Coast Solar wants to help! Read on to learn more! Although you may find information stating that green energy cannot power the entire world, West Coast Solar is here to prove otherwise. If every single home around the globe produced their own power, there would be an abundance for less long-term financial and environmental cost. We hear frequently that the initial investment for a home solar energy system is the biggest barrier for many homeowners. They don’t want to finance or pay for the system outright. Although they make a fair point about the cost, we believe in long-term, high-return investments, and we believe solar power is one of them. On average, a solar system lasts about 25 years. It produces more power than the average house uses annually, which reduces utility costs. Additionally, a solar power system stabilizes energy market prices alongside reducing carbon-emission to produce energy to zero. Renewable energy is one of the few ways you can save money and save the planet at the same time when it comes to energy. Green energy research is ongoing and advancing. Solar power systems are also being advanced and upgraded at a good rate. As the years pass and studies continue to be published, more advanced technology and efficient means of collecting the sun’s rays and converting it into electricity will come along. This will drive costs down, and allow for a more affordable green energy solution to everyone. An average house in the US emits about 20 metric tons of carbon annually. If we install a solar power system on that house, the carbon byproduct is reduced to virtually nothing. The greenhouse gas effect is reversed, and our planet is left to our families and children for generations to come. Did we mention you get to save money while you’re saving the planet, too? Technically, the sun will eventually burn out, but it most likely won’t be in our lifetime or for a few more generations. Solar, wind, hydro, and various other green energy resources are renewable, meaning non-exhaustive. This means as we advance green energy production technology, we’ll be able to leverage more of the sun, the wind, and the water to provide clean energy for our homes and businesses around the world. Not only will we use more green energy, but we will use less traditional energy, reducing pollution. Solar Power Systems are relatively low when it comes to maintenance cost. Once they’re installed a bi-annual checkup typically keeps them functioning properly. The best part is that solar-system installation is labor intensive. Every roof or property solar panels are installed, the space and area require a unique design. This means as the solar energy sector grows so will the opportunity for jobs. Many have voiced concern towards the difficulty of moving from traditional energy to renewable energy. We won’t deny that the market is tough, but if the jobs are available, we will need people to fill them, which means economic growth. If you’re looking to reduce your utility bill, give West Coast Solar a call. We help customers all over Sacramento save money, help the environment, and create a better future for their family. We custom design each solar system for our clients to fit their energy needs and space requirements. Don’t wait, call today!